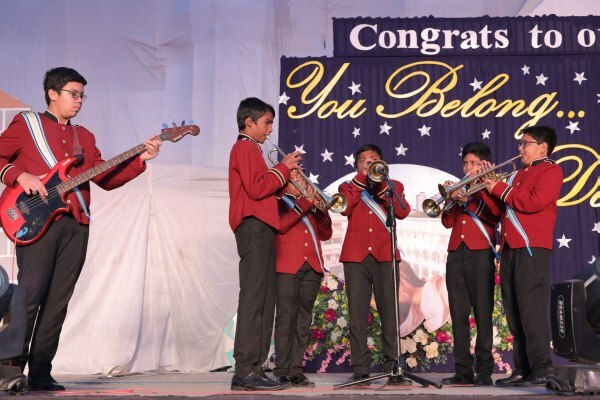 On February 8, 2019, Don Bosco High School, Matunga celebrated its Annual Thanksgiving Day with more than 2200 students from the Kg, Primary and the Secondary sections performing on a massive stage specially erected for this occasion. It was an opportunity for the young students to showcase their talents under the able and watchful direction of the efficient team of teachers. The occasion also provided a chance for the children to display to the audience the significance of a disciplined team performance on such a large scale. The school brass band with drums, guitars, trumpets and saxophones played in harmony under the direction of their bandmaster Mr. Saby Franco to welcome our chief guest for the day, Father Crispino D’Souza, our Rector. He was accompanied by the other two members of the management, Principal Fr. Bernard Fernandes and Vice-Principal Administrator Fr. Roy Noronha, and the lay leaders of the institution – Asst. Headmaster Mr. Cliffrichard D’souza, Co-ordinator Mr. C. Rai, Head teacher of the Primary section Mrs. Griselda Fernandes, Secondary Supervisors Mrs. Christina Mascarenhas, Mrs. Lakshmi Krishnan, Ms. Pauline Vallado and Kg Supervisor Mrs Shoba D’Souza, who too were felicitated on this day. “It is an honour for me to have a second inning in this hallowed institution. The school is great because of the people who make it great with their leadership qualities, dedication and tireless work done in school”, said Father Crispino in his speech while addressing the audience. The quadrangle was a sight to behold with a sea of people assembled in every available space to witness the event. Everyone tried to get hold of a seat that would provide them with a vantage view of the day’s proceedings on the stage. The zoomed in digital screen gave a live recording of the happenings on the stage. Backstage, the children with well designed costumes and make up awaited their turn on the stage with enthusiasm and eagerness. Every child from the Kg and the Primary section was given an opportunity to perform on the stage. Today, the tiny tots of the Kindergarten (morning batch) touched the chords of the heart of the people in the audience with their prayer song ‘I will rejoice’. This was followed by the Environment song performed by a section of the Kg students and Std I. It asked us to build a better future, and the need for it was now! Moving their body to the dance steps of song ‘Made for Now’, Std 3 students welcomed everyone to this our annual day function. The members of the Management and the lay leaders were then felicitated on the dais. A simple yet deep felt note of gratitude was addressed to them by Master Zian Irani from Std 4 and Master Eric Saldanha from Std. 3 behalf of the students and staff. After the Felicitation of the dignitaries, the detailed Annual Report of the year 2018-2019 was screened – the second part of the annual report was screened during the break – and this was followed by the Prize Distribution ceremony for the prize winners and scholarship award holders. ‘We live in a world full of chaos, confusion and cut throat competitions,’ thus began the compere introducing the musical ‘Seven Brides for Seven Brothers’ staged in the evening. ‘We need to make a difference in this very world of ours’. 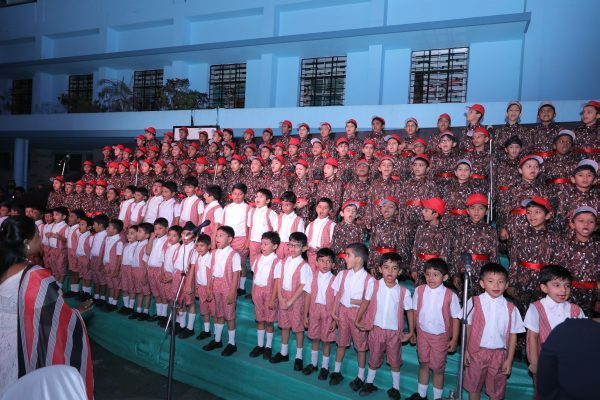 The Annual Day Programme revolved around the school’s theme for the year, “My Neighbour My Responsibility”. The well executed mega entertainment production “Seven Brides for Seven Brothers” where Milly transforms the bad mannered siblings is a classic reminder for us that change is possible in our world of greed and chaos. The musical of 1954 rolled on with the sound and light effects to the tracks of fun loving Hindi songs ‘Sath Rang’ and ‘Satte pe Satta’ which delighted the crowd. Thereafter it was pure fun and entertainment with the children regaling the crowd with some classics, ‘Going courtin’, ‘Wonderful day’, ‘When you’re in love’, ‘Marry in June’, ‘Bless your beautiful hide’, ‘Sobbin women’ and ‘Lonesome polecat’. ‘Barn dance’ was a class act! The actors on the stage didn’t let a moment of boredom slip by for the audience with their energetic and witty performance. “The “hate” that eventually melted into affection touched many hearts. 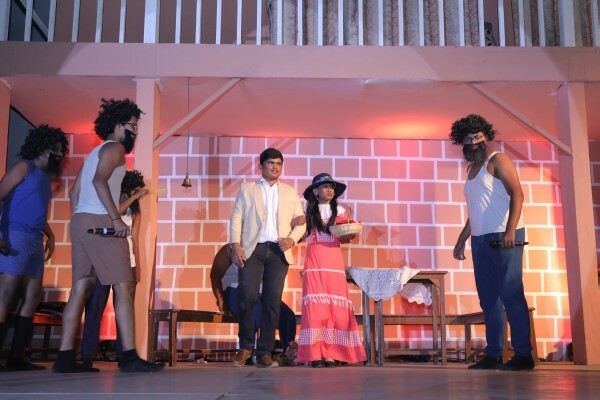 ” Good choice !The audience are definitely connected with the musical as we’ve all grown up watching the Hindi version and I thoroughly enjoyed it” says Mrs. Vailena , the teacher of primary section expressing her views. Father Bernard Fernandes, the Principal expressed his deep gratitude to the members of the Management, Supervisors and Heads, and the entire staff for dedication and days of preparation. It was indeed a well executed annual day function with some near flawless performances. The audience went back happy to be a part of an entertainment by the zealous school children.